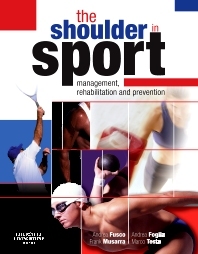 The book is divided into 5 sections: the first and second sections provide introductory topics, such as anatomical variances of the articulations and soft tissues, the biomechanics of the shoulder, diagnostic imaging, specialist and functional examinations. The third section is dedicated to the description of surgical solutions in acute articular, muscle and tendinous pathologies. Rehabilitation and prevention are described in the fourth section, where the authors present exercises of post-surgical rehabilitation, techniques of mobilizing in manual therapy and load multidimensional model. The last two chapters in this section are dedicated to prevention, especially of chronic pathologies, using intervention influencing programmes, methodology of training and how to rectify incorrectly performed movements. The last section is dedicated to the use of electromyography of the surface. This method is used to register muscular activity during training; the description contains practical information and a great number of references of clinical interest.